With a history stretching back to the mid-19th century in the state of Ohio that began with the company’s founding at French Steel Range, Cleveland has been a fixture in the world of steam cooking equipment and US-based manufacturing. After moving back to the city of Cleveland in 1898 and creating its food service division twenty-four years later, the factory became an innovator in providing the first stainless-steel steam cooker to feature thermostatic traps, the pressure relief valve design, removable aluminum doors, and an atmospheric steam generator. With a time-tested product and an innovative track record, it’s no secret that Cleveland Range provides high quality designs in what’s often identified as the most efficient means of food service production. Following the introduction of pressure-less convection steamers and counter-top units in the 1970’s as well as a line of tilting skillets and steam-jacketed kettles during the subsequent decade, the factory has maintained its reputation as an industry standard barer that’s continued with FE&S Magazine’s 2017 “Best in Class” designation for all three product categories. From 16-pan capacity Convection Pro floor unit to the submarine-like hatch pressure models, the manufacturer provides steam capable cabinets for applications ranging from counter-top without water line access to electronically-controlled designs with automatically compensating timers. Features like the Gemini’s removable/reversible gaskets, automatic generator blowdown, and the built-in standby mode allow for quick recovery and energy efficiency. Whether a facility requires natural gas or electric power supply and production calls for “boiler-less” or generator style units there’s a product offering to fit customers’ needs. 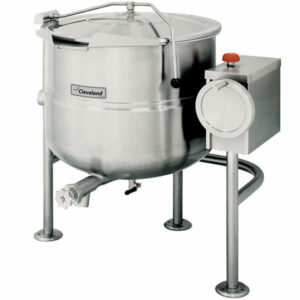 The manufacturer’s offering for both steam jacketed kettles and braising pans includes features designed for real world applications with counter-top and 30/40 gallon capacities at 35” work heights (skillets) for ease of access along with manual and electric tilt features, optional tangent draw-off valves, and splash-proof controllers. With direct steam capability and cooking capacities up to 100 gallons, Cleveland’s steam-jacketed kettles fit a wide range of production demands from independent restaurateurs to institutional facilities such as universities and correctional locations. As a Welbilt branded company with a characteristically full model offering, the line extends out to mixer kettles, cook-chill systems, and industrial/custom designed equipment. 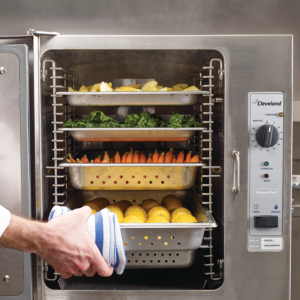 In line with the equipment’s factored-in ROI and life cycle costs, product specification required for everything from cook-to-order items to bulk-produced and vacuum-sealed inventory can be met with Cleveland Range products that both last for years and serve as profit centers for food service operations. From specification to quotation and end user training, The Hansen Group is proud to represent this manufacturer throughout Georgia, Alabama, and Tennessee. Whether discussing optional accessories, quoting water filtration systems, or recommending the correct depth hotel pans and reviewing equipment cleaning procedures, please reach out to our Cleveland Brand Champion, Eric Kenny for everything entailed in commercial steam cooking.